Can eavesdropping ever be considered a good thing? Scientists seem to think so—and they’ve set up the listening devices. 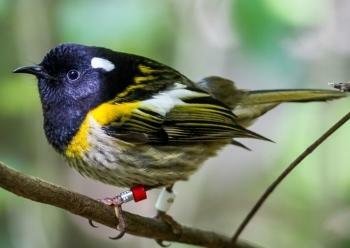 Researchers in New Zealand discovered that monitoring an endemic bird with an acoustic recording device can provide valuable data without disturbing the reintroduced population. With a 60% decline in population size among birds, mammals, fish, reptiles and amphibians in the last 40 years, this technique is a boon to conservation efforts. The “star” bird of the study is the sparrow-sized hihi or stitchbird (Notiomystis cincta - photo courtesy Janice McKenna). Striking males have a black head with a band of bright yellow feathers splashed across the shoulders and wings. Those sunshine yellow feathers earned the bird the name ‘hihi’--the Maori term for ‘healing rays of sunlight’. These birds were thought to be carriers of the sun, harnessing the sun’s healing rays and casting them into the forest. Yet these harbingers of healing met hard times with the influx of humanity in the 1800’s. The hihi population fell prey to disease, habitat loss and predation. By 1883, the once flourishing hihi became extinct on the mainland and survived only on Little Barrier Island. In April 2017, a plan to reintroduce the species to the mainland was hatched. Forty juvenile hihi birds were released, but the problem of monitoring the population needed to be overcome: "Physically monitoring animals in the field or fitting them with radio-trackers can be invasive, expensive and more importantly can influence the behaviour or survival of individuals,” said Dr. John Ewen, Senior Researcher at Zoological Society of London and author of the study. They needed another way. Enter Operation Eavesdropping. Fellow researcher Oliver Metcalf, explained: "By recording and listening to the hihi calls, we were able to figure out how the birds were using the area they'd been reintroduced to. Using the calls, we found the birds moved from an initial exploration phase around the habitat, to a settlement phase -- meaning the birds had established their own territories, or in other words -- a sure sign of a happy hihi." Happy hihi indeed. In today’s world of ecological doom and gloom, remember it is within our power to take positive steps to help restore our environment. Even if it means a little eavesdropping.